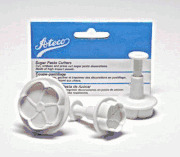 This set of 3 Daffodil Flower cutters are made of high impact plastic. Once the sugarpaste is cut the plunger helps you to push the shape out with ease. The plunger embosses the leaf imprint onto your Gumpaste as you push it out of the cutter.